Kung Fu, Acrobatics or Opera in Beijing? Kung Fu is a generic term for the many diverse Chinese Martial Arts. Martial Arts have been applied by the Shaolin Monks for over fifteen hundred years, as a distinctive expression of their religion. 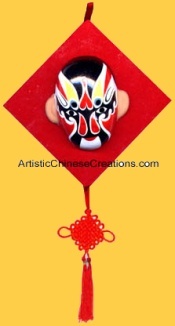 The term Shaolin has become to represent discipline, power and courage. 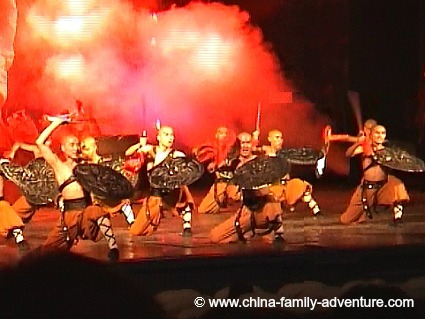 The Shaolin Shows in Beijing are action-packed performances, dynamic and mystical, full with quantum leaps, power and speed. It was the perfect end to a long day, the kids thoroughly enjoyed it. We highly recommend it! 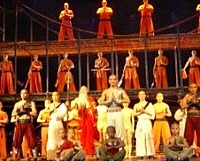 The Kung Fu Show in Beijing we attended was "The Legend of Kung Fu", at the Red Theatre. Check the location on our Beijing Map here. There are several daily performances. There are also different tour packages, some include a little sightseeing, dinner and a show, you get picked up and dropped off at your hotel making it very hassle free. See below for some options. Another alternative that will please the young minds, is a Chinese Acrobatic Show. These are astonishing performances. It is amazing how the young acrobats contort themselves while balancing objects with extraordinary accuracy, grace and coolness. They make it all look so easy, what in reality must have taken years and years of determination and practice. Beijing is a good place to catch one of this shows. If you happen to miss it here, Shanghai is also a good place to see them. 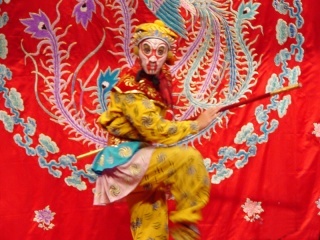 Chinese Opera is a widespread style of drama. It is drawn from popular legends and folklore which is characterized by face painting, acrobatics and elaborate costumes. Traditional Chinese instruments accompany the acting. Dialog is in Chinese. Opera Facial Make-Up utilize many colors, each representing a unique stereotype character. Dark red is reserved for loyal old generals while golden and silver are used for Buddha, gods, ghosts and demons. Opera facial make-up is the product of fine artisanship. It has become part of the masterpieces played through the years and a very intrinsic part of Chinese culture and art. 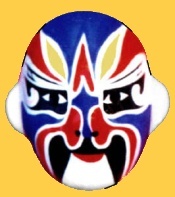 Chinese Opera Masks make excellent decorations.